One of our farm leases contains a 110 acre cornfield along the James River in Central Virginia. Once this field is cut, the doves come in to feed on the leftovers and the action can be awesome. If you love to make the barrel of your shotgun glow from the action on a good dove hunt, this is the place. You will be taxied to and from your shooting station via haywagon. Once the hunt concludes, you'll enjoy the pig roast barbecue with all the fixings. 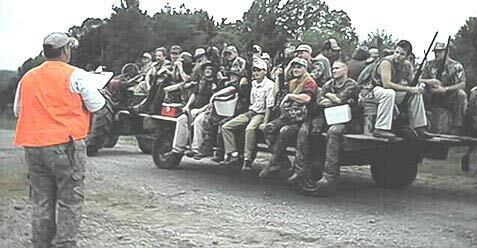 This is a great corporate hunt or an ideal day with that special group of buddies. Because of the size of the cornfield, we need about 50 people on 25 shooting stations to block off the field. We ask that all interested call ahead to get their name and size of party on our hunt list and once we have enough hunters to keep the birds moving, we announce the hunt. We will do about 3 dove hunts per season, so call now to get on the list to get your season off with a bang.